I talked about atool a long time ago, and dtrx is the other universal extraction tool that I know of. dtrx’s best features aren’t visible in that screenshot. For one, the list of archives it supports is quite long. 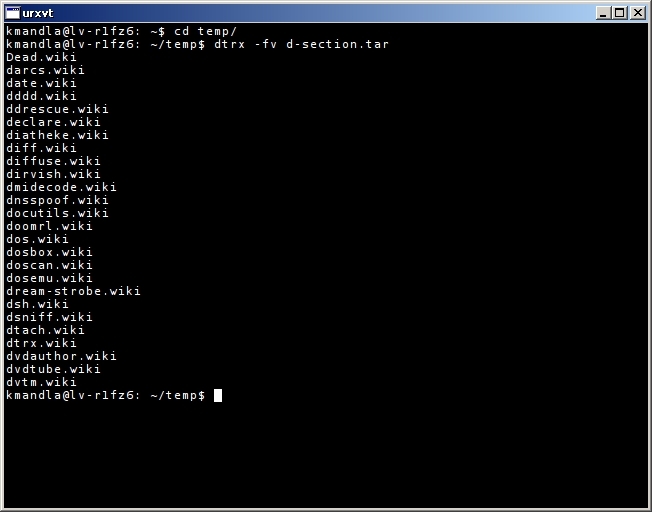 On top of that, by default dtrx sends the output into its own directory. I, for one, get a little tired of force-feeding unzip the flag to dump into a dedicated directory. Little things like that are what I prefer. I suppose it’s worth mentioning that you can’t just automagically extract anything from any archive, without installing the supporting packages for that compression. So don’t complain to me when dtrx can’t open a rar file, and you don’t have unrar installed. This entry was posted in Linux and tagged archive, extraction on 2013/10/13 by K.Mandla.